When you hear the sound of streaming water moving across the stone, it has to be one of the most relaxing and inspiring sounds ever imaginable. This kind of sounds can bring into your mind visions of nature such as small streams and meandering rivers. Moreover, it can also drown out all unpleasant noises like nearby vehicles and pedestrian traffic as well. These are just a few reasons why many people would want to install indoor slate wall fountains in their living space, whether at their homes, offices or even commercial spaces. Another reason why people rely on slate fountains is that slate is a flexible material that can be used for various designer and decorator styles. A modern room or house can use indoor slate wall fountains readily as an organic or “all natural” sort of home can too. Also, it is important for you to keep in mind that slate is readily available in a wide-ranging palette of natural-looking colors and patterns. Furthermore, if you go to a high-quality manufacturer or distributor that sells indoor slate wall fountains, they can provide you with a selection of base styles and frames so you can choose which one coordinates well with your chosen variety of slate. For example, you won’t have a difficult time in looking for a rajah, green or black slate fountain that has a wooden, copper or stainless steel frame. The slate’s natural colors enable them to coordinate well and look good with almost any décor. 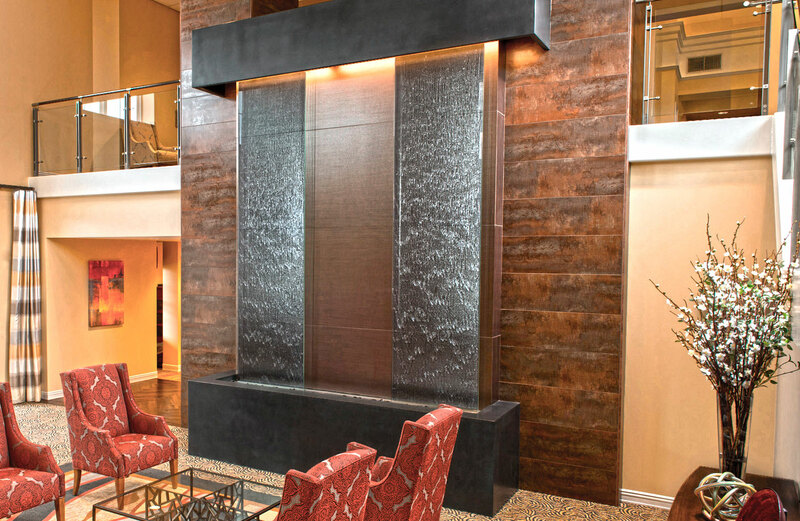 Indoor slate wall fountains come in a visible texture unlike metallic floors or other fountains that are made out of stainless steel or copper. The stone’s surface is rougher than any flat piece of metal, so this creates a movement and makes a ripple effect in the water while it passes the surface. Unlike the purely metallic floor, desktop, garden, or wall fountains made of copper or stainless steel, the slate water fountains come with a very visible texture as well. The surface of the stone is far rougher than a flat piece of metal, and this creates “movement” or ripples in the water as it passes from corner to corner across the surface. Naturally, when you choose to install an indoor slate wall fountain inside your home or office, one of the main problems that you have to deal with is its weight because its materials are extremely heavy. You will have to consider the fixture’s location well in advance before installing for the main reason that it should be mounted onto the wall studs and not just of the paneling or sheetrock. You should also think about the location of power outlets as well. Many fountain owners do not like a viewable power cord hanging down from behind the fixture. If this is your preference, you should have a wall plug that is properly installed into your hanging space behind the unit before mounting the fountain. Interestingly, because indoor slate wall fountains have gained so much popularity over the years, it has driven the best manufacturers to build versions of it that are based on a thin surface of natural slate that is attached to a backing of lighter weight. This is good news for you if you want to get rid of all the worries and stress about having to mount large, heavy slabs of stone yet obtain the same beautiful features and natural qualities of heavy slate fountains.